I have been creating a lot of soups and stews in the crock pot recently. Mostly because of A. working outside and B. because it smells fab when cooking and C. because by the time I am actually hungry later on, I can’t be bothered to cook anything. Charlie usually pesters me to eat. I realized the other day that my fiber world has overtaken my culinary world. No, I am not putting bamboo and silk in the soup, but I am color coordinating the ingredients. My First Color Coordinated Soup. The Reds. Throw it all in the slow cooker, making sure the bacon is the last thing and on top. Pour boiling water over the food and bring level up to about top of food and a little under lip of slow cooker top. Put the lid on idiot…I mean you didn’t forget that did you? Put the slow cooker on high and leave for 4-6 hours, than turn down for 2-4 more hours on low eating it whenever you feel like in that later few hours. If you are going away, I would put it all together before you get ready for the day, leave it on high while you get ready for work, than switch to low for the day until you get home. I didn’t try to colour coordinate it, it just happened. Is this what you call Hand Dyed Soup? Or is that Hand Painted Soup? I threw this together with whatever I could find lying about the Smeg and China Cabinet. I made it about a week ago so I think that was what I put in it….more or less…probably…most likely…..yeah, of course that was what I put in it. 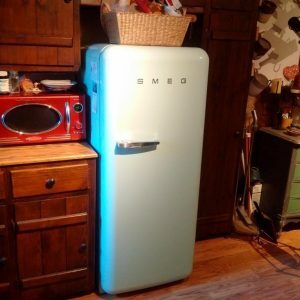 Oh by the way, what is a Smeg you ask? Here is my Smeg. We finally got it this fall.